The coffee tree is indigenous to equatorial Africa, and typically produces about 1 kilogram of green coffee beans per year. As expected, the claim of ownership for the discovery of coffee has many parents. One legend from the ninth century purports that a goat herder from Kaffa, named Kaldi, noticed his goats would not rest after eating the coffee cherries. Another legend relates that while in Ethiopia, Omar, a mystic from Yemen, noticed birds behaving oddly after eating the coffee plant berries. 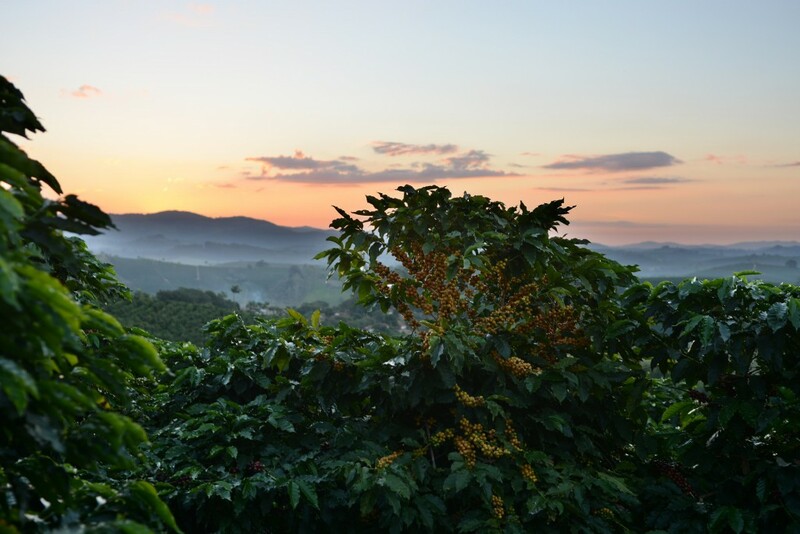 The eventual discovery of the energizing effects of coffee most likely occurred many centuries ago on the southern highlands of the current Federal Democratic Republic of Ethiopia where large natural forests of coffee plants exist. The odd behaviour observed in the birds and goats more than 400 years ago is similar to the physiological response to caffeine in the human body. As quickly as 15 minutes after drinking a cup of coffee, blood caffeine levels are at their peak. Those who drink a cup of coffee in the morning recognize the allure of its aroma, often before they acknowledge being fully awake. Some even go to the extreme of avoiding interacting with others until they’ve had their first cup of the day. So, what is it about coffee that draws people in? Part of the attraction can be explained by the physical effect caffeine has on the brain. Caffeine absorption occurs mainly in the stomach, but can begin inside your mouth! The effectiveness of caffeine in making you feel more awake and happy lies in its ability to block the activity of another chemical substance, adenosine. As we utilize the energy from ATP molecules and they degrade during the day, adenosine builds up in the brain. Adenosine belongs to a class of chemical messengers called neuromodulators that can regulate the actions of a population of neurons. The effects are diverse; it can stimulate or prevent the release of neurotransmitters, and can even reduce the response of a neuron to a neurotransmitter. For example, in neurons of the peripheral nervous system (PNS) that control muscle activity, adenosine inhibits the release of the neurotransmitter acetylcholine. In the central nervous system (CNS), adenosine modulates the activity of several neurotransmitters such as serotonin, acetylcholine, norephinephrine, gamma-aminobutryic acid (GABA), glutamate, and dopamine. Adenosine Receptor. Close-up view of the synaptic cleft (interneuron space) between two neurons in the brain – the axon terminal of one neuron and the dendrite of an adjacent neuron. Adenosine is the chemical messenger (or neurotransmitter). When it binds to a specific receptor on the dendrite of an adjacent neuron, it causes a nerve impulse to be transmitted. A part of the caffeine molecule closely resembles the double-ring structure of adenosine molecules. This similarity of structure allows caffeine to act as a competitive antagonist for the adenosine receptors on neurons. Chemical antagonists, like caffeine, are able to bind to the adenosine receptors blocking the adenosine molecules that would normally bind, thereby reducing normal activity of the receptors. When adenosine is unable to bind to its receptor, neuron activity does not slow down; it increases. The increased brain activity affects the hypothalmic-pituitary-adrenal (HPA) axis, a feedback system that includes three endocrine glands in your body. The hypothalamus is an almond-sized gland that lies deep within the centre and base of your brain. At the end of the hypothalamus lies the pea-sized pituitary gland. The caffeine induced increase in brain activity causes the hypothalamus to stimulate the pituitary gland to secrete adrenocorticotropic hormone (ACTH) which travels in your blood stream to the outer region of the adrenal glands sitting atop each kidney. The two adrenal glands stimulated by ACTH then secrete a number of hormones including epinephrine (i.e. adrenaline) and cortisol. Adrenal increases your heart rate and breathing as well as blood pressure. The cortisol releases stored glucose for a quick boost in energy. The brain interprets all of these changes in your body’s biochemistry as an emergency and the pituitary gland signals your adrenal glands to release adrenaline. This results in the feelings of alertness and preparedness in a mild form of the “fight or flight” response. Fight or flight response: Your body’s physical reactions to a perceived fear of being harmed. For example, your heart rate and breathing increase in preparation to run or fight. Processes that cannot aid in this ‘readiness’, like digestion, are slowed or stopped. Humans are motivated to repeat activities and experiences that make them feel good. This motivation is driven by a ‘Reward Pathway’ in the brain. The pathway originates in the brain stem and extends into an area of the brain called the Nucleus accumbens (Nac). Dopamine, a neurotransmitter, activates the brain’s reward pathway. 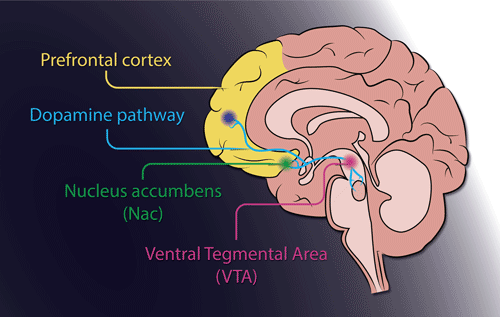 The pathway is activated by a stimulus that provides a trigger for the release of dopamine in the NAc. Dopamine molecules bind to specific receptors in this area and elicit a pleasurable response. The more dopamine that is released, the greater the pleasurable feelings. The Reward Pathway is a powerful force in influencing behaviours required for species survival. It is also a compelling force in creating dependency on certain foods and drugs. Under normal conditions, dopamine is released from the axon terminal of one neuron in the brain and binds to the receptors on the dendrite of an adjacent neuron. This results in the transmission of an nerve impulse to be carried through the neuron. Dopamine then disengages from the receptors and is recycled back to the original neuron via dopamine uptake proteins. Dopamine is regularly recycled and broken down by enzymes to keep the concentration within a homeostatic range. Caffeine Blocking Adenosine Receptors. Close-up view of the synaptic cleft (interneuron space) between two neurons in the brain. Normally, adenosine (pink) inhibits the release of dopamine (yellow) when bound to the adenosine receptor (dark pink). In the presence of caffeine (blue), however, adenosine is blocked from binding its receptor and is unable to inhibit the release of dopamine. This results is a release of dopamine into the synaptic cleft which binds to the dopamine receptor, eliciting a nerve impulse. 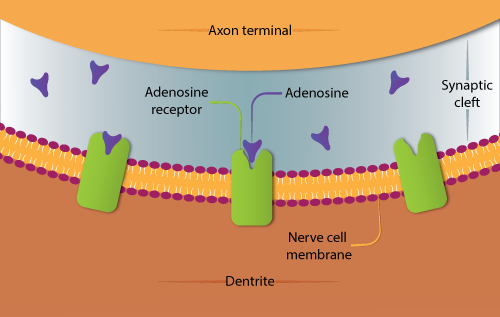 Within the reward pathway, adenosine regulates the release of dopamine in two ways: by binding to adenosine receptor A1 at the axon terminal of a neuron, inhibiting dopamine release (Figure A above), and by acting as an antagonist and binding directly to the dopamine receptor. 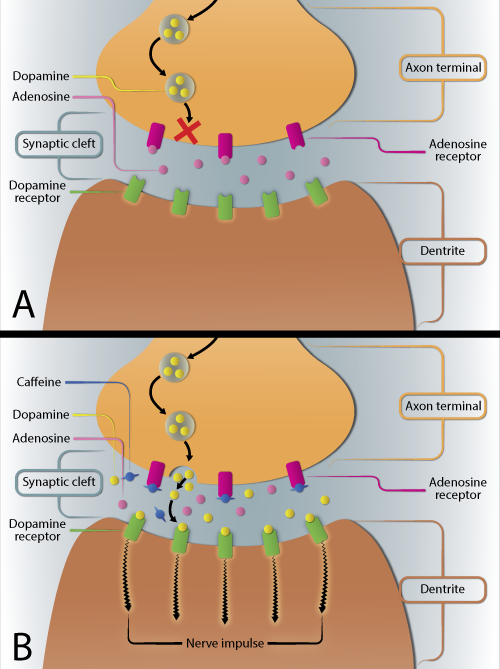 When caffeine interferes with the ability of adenosine to bind these receptors, the release of dopamine is stimulated, and dopamine receptors become available for binding (Figure B above). Once dopamine binds to its receptor, the reward pathway is activated. Excess dopamine builds up in the interneuron space and continues to bind to receptors on neurons, which increases the number of nerve impulses, thus intensifying the signal. A build up of dopamine in the synaptic cleft stimulates the brain to compensate by getting rid of the excess. This is usually accomplished by enzymes that break down the dopamine molecule. In cases of a large increase in dopamine concentrations, the brain will also signal the development of more dopamine receptors. The increase in the number of dopamine receptors results in a decrease in the intensity of the nerve impulse. Over time, the distribution of dopamine gets out of kilter, and your brain chemistry can become desensitized, making the reward pathway less effective. This desensitization means you will need to drink more coffee in order to make you feel the same effect. 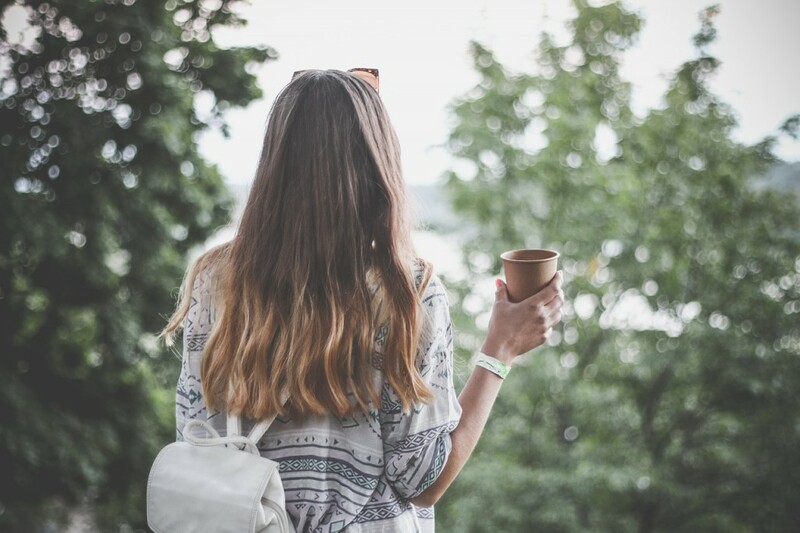 To do this, you will drink more cups of coffee more often throughout the day. When you try to give up coffee, be prepared for the physical and emotional impacts of caffeine withdrawal. Going “cold turkey” results in a massive break down of dopamine molecules by the large number of specialized enzymes that have accumulated to deal with excess dopamine over time. The depletion of dopamine and adrenaline leads to symptoms of withdrawal that can include drowsiness, anxiety, muscle cramps, and irritability. This video will help you understand how timing your morning cup of coffee can help you get the most optimal caffeine buzz.